It was a beautiful Spring weekend here in Texas, but it didn't start out that way. It was Friday and I sat at my desk, looking out the window as the raging wind tugged and pulled at our crepe myrtle trees. The sky was overcast and I began to wonder whether this camping trip was going to work out. I normally don't work Fridays, and would have been helping Tara more with the packing, but a 5-day training had me working my day off. What a week, too! The class was interesting, probably more so because the guy doing the training sounded a lot like Tracy Morgan. It cracked me up. But I was struggling with migraines and power outages, flexing my contingency planning by switching to battery and tethering my connection off my work cell. In the end, I was victorious. Still, the weather contended to bring our weekend plans to a halt. This wasn't just any old camping trip, though. 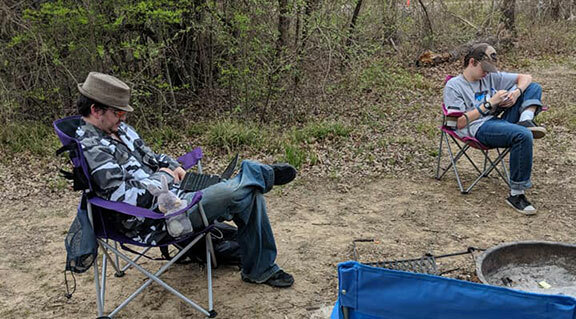 This was a family camp out with my daughter's girl scout troop. So, as my training came to an end, we finished packing and kept an eye on the message board, watching for any sign the event might be cancelled. Finally, it came time to make the call. Families were heading out and it looked like the trip might actually happen. I fastened the last of the tie-downs on the cargo trailer and we hit the road. 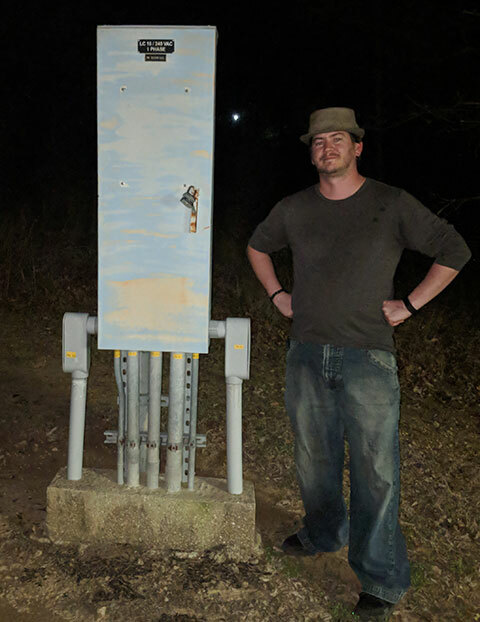 A rare photo of me posing with my biggest fan, an AT-AT inspired electrical panel nestled in the woods. What can I say about what happened next? As with all things, it's usually best to start with the truth. And the truth is, we had a really good time. I mean, yeah, it was a little chaotic at first as we tried to figure out which camp site to hunker down in and all that. We've got a little one who regularly wakes during the night and we didn't want to be too big of a bother for the other families. But we got it all figured out within a short little while. The kids did an amazing job setting up the tent while Tara and I unpacked and arranged the camp kitchen. Before we knew it, the sun was beginning to set and we rushed to finish cooking some pork chops on the new camp stove. Just as we were about to sit down to eat, Tara got called away to a parent meeting. I let the kids tuck in while I did my best to keep Tara's food good and warm. I was happy to get in some writing time with Gryphon. We're working on a project together, writing books set within the same fictional world. I'm super excited about it. I'm already 18K words in and almost done with Act I. Final Hope is still coming along, but I've had some trouble with the complexity of it. That and I know it's not really a mainstream type of book. I've been working so hard on it for so long that it really does feel like work every time I sit down to write. This other project is different and I'm really enjoying the sense of fun and adventure the new world has brought back to my writing. Anyway, I suppose I better get back to work. I'd hate to keep my fans waiting, even if they do just look like very tall chunks of metal hanging out among the trees. I have about six and a half chapters left to rewrite for Final Hope before Book 1 of the Chlorophyllium Collection is complete. But hitting that wall has been hard to contend with. Do I think it's a good story? Haha, I sure hope so! I've certainly invested a lot of time and effort into it. It's just that I wonder how many people will enjoy it for all that complexity I've worked so hard to contend with. Maybe it won't be a big hit. I'm starting to come to terms with that. Final Hope, more than anything else, has forced me to grow so much as a writer. I've never worked so hard for so long on any other writing project. And somewhere along the way, I started to develop a better sense of self within my writing. I'm still not a fast writer by any means. I'm not an overly confident one, either. But I have proven to be more of a consistent writer. I've shown up even when it's been hard. Maybe not every single day, but consistently. That's a pretty big deal, I think.